Saw he has no thread yet, only threads about particular works of him. I love the cd's released on Naxos, Symphony 2,3 and The Light / Heroes Sympony, but I'm less impressed by some his more older/well-known works. The sound samples sound very well. Looks very interesting. I played in the US premiere of Glass' cello concerto in San Diego last year. Wendy Sutter was the soloist and Glass came to the final rehearsals and the performances. There is a film about that on youtube: http://www.youtube.com/watch?v=2IxWK29i-UI with interviews with Glass, Sutter and our conductor Stephen Schick and the complete performance. 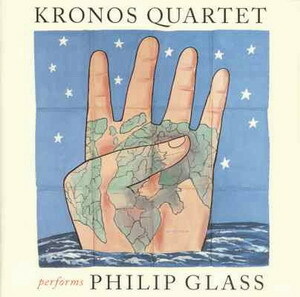 The only Glass I've found myself really enjoying is the early-ish work Another Look At Harmony, Part 4 (which IIRC now has two recorded performances). Some of his later stuff can be "okay" as easy listening, but not interesting, and some of his early stuff repeats too much to maintain interest, but ALAH4 is both very minimal (and long - 50 to 60 mins) but this is countered by its amazing shifting choral textures, and when in the right mood I find it impossible to interrupt a listen of this piece. 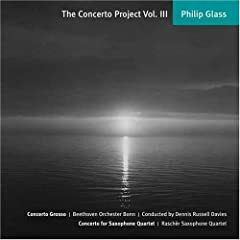 Glass' Violin Concerto is very good, I like it a lot (Takuo Yuasa/Naxos). Glass also made interesting collaboration with Mark Moore (one of the best DJs in the world and the "godfather" of British acid house scene) in late 80's. That's how I was introduced to this composer in the first place, long before I got into classical music. me, too, definitely my favorite Glass. Doesn't get annoying either, very alienlike and fun music. I'll give a spin to that disc. I played in the US premiere of Glass' cello concerto in San Diego last year. M, is that you sharing the principal's stand? wow, nice to listen to that one! 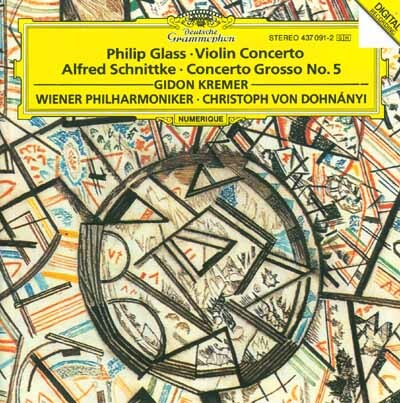 My favorite Glassian moment is the slow movement of Symphony No 3. Has an almost hypnotic effect on me; in the past it has convinced me that maybe Pachelbel's Kanon would have been cooler if Philip Glass had written it. Generally, the UCSD TV guys (probably students from some "media" classes) and whoever directed and edited this don't really seem to have a clear idea of how to film an orchestra. They almost exclusively cut to the bass section when we played slow, quiet stuff. But there is also some real "action" stuff in there which of course looks much more interesting, especially when it comes to the basses where dynamic music directly translates into dynamic movement (or rather, the other way around...). At the beginning of the second movement, we had the main theme, but they filmed the horns which had just accompanying figures You can't really hear that so well on youtube either, but in the DVD I have, you can actually hear us much better (and, of course, not just us basses, the whole orchestra sounds much better than here on youtube). maybe they just didn't know what they were doing? could you at least get in an orchestra in Europe? what was the other job you had? really cool to see you in action! I've never got past the perceived monotonousness of Glass' music. I find it to be the most predictable music in the world, and I don't see how that's a good thing. Would you call Glass a genius? When I met him during the final rehearsals for the cello concerto, I called him "Philip". The last one was taken in August 3 years ago in Seattle, during the NorthWest Mahler Festival. We played Mahler 2. Two other members of the LJS were there, too, my standpartner Chris (4th from left) and Bill (2nd from right) who had asked us to come. He had lived in Seattle before moving to Southern California so he had participated in that festival for many years. Next year, the LJS will also play Mahler 2 - we already talked about me coming over and reinforcing them for that. I hope that will work out scheduling wise. Let me guess, Philip called you a genius?